Ubud brings you a combination of beautiful natural surroundings and a fascinating culture. The town is at the heart of Indonesia’s Buddhist culture, with a delicious, unique cuisine, wonderful temples, and spectacular luscious landscapes surrounding the town. Couples will love the relaxing atmosphere and the chance to explore art galleries, take yoga classes, or hit the spa, while families can head to the Monkey Sanctuary for the experience of a lifetime. Head to the emerald green rice paddies, which are built into the side of a hill and offer spectacular views. Wander along the fringes, taking in the pretty flowers and palm trees, interspersed between the fields, or enjoy lunch at the top and look down over this unique area. Artists are inspired by the beautiful natural surroundings and many have set up shop in the little villages surrounding the town, making it the perfect place to pick up unique works. Alternatively, immerse yourself in Ubud’s history with a tour of the temples which are peppered throughout the area. 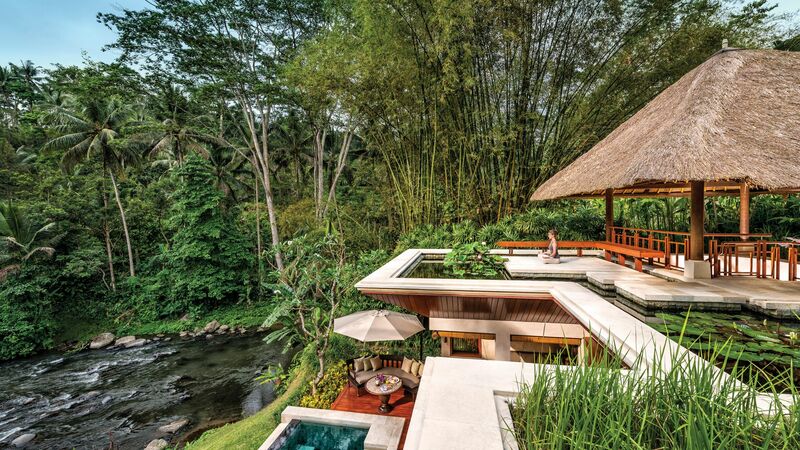 Holidays in Ubud take you to one of Bali’s most celebrated towns. It’s home to a fascinating history, as well as a unique modern culture. You’ll find Buddhist temples and retreats throughout, with plenty of opportunities to relax in a spa, or try yoga lessons. Taste delicious cuisine created using fresh local produce, or simply spend your days relaxing by your hotel’s swimming pool. Choose Sovereign for your luxury holiday in Ubud and we’ll help you find the best hotel for your holiday. We’ve carefully curated a selection of the area’s top hotels, with our experts staying at each one, to ensure it matches up to our exacting standards, and yours. Stay at the Four Seasons Sayan for rustic details like thatched roofs and ponds, pools, and terraces built in the style of the rice paddies and overlooking the crystal clear waters of the stream. The Samaya Ubud is a fantastic choice for those wanting to enjoy the privacy and serenity of a private villa, with all the facilities of a luxury hotel within easy reach. Transfer time from Bali airport to Ubud is approximately 90 minutes.